Born in 1914 in Los Angeles, R.G. Smith developed an immediate lifelong love of aviation following Charles Lindbergh's successful solo crossing of the Atlantic in 1927 in the "Spirit of St. Louis". R.G. 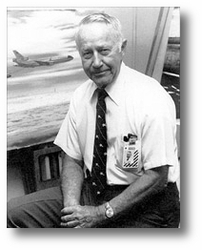 Smith began his career in 1936 as a configuration engineer with Douglas Aircraft. 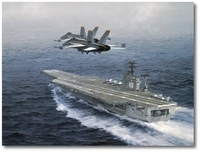 For the next two decades, he was involved in the development of all Navy combat aircraft built by Douglas and its successor, McDonnell Douglas. 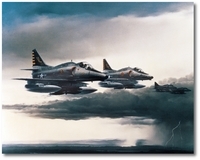 While helping to design such classic naval aircraft as the SBD Dauntless, AD Skyraider, A-3D Skywarrior, F-4D Skyray, and his personal favorite, the A-4D Skyhawk, R.G. Smith was also developing a reputation as a respected artist. 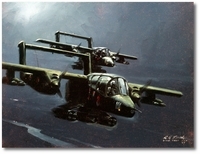 When asked to draw or paint for aircraft proposals, the largely self-taught artist used his knowledge of airplane construction and function to give life to the aircraft in his artwork. According to R.G. Smith, the three essential elements in his approach to painting were accuracy, planning, and the power of suggestion. 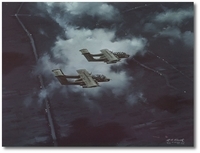 To ensure accuracy, he studied the desired scene or event, viewed his subjects from all angles, collected paint chips from aircraft, and in some cases, actually observed aircraft in combat and at sea. He planned each piece by sketching aircraft from several angles before painting them on the canvas, occasionally using models that he built as guides. Instead of painting every bolt and rivet, Smith blended colors to add motion and subtlety to harsh lines, allowing the eye and brain of the viewers to connect the dots and lines. The result was a sense of reality, atmosphere, and energy. At the start of WW II, R.G. Smith was told that his work at Douglas was vital to the war effort and that he was barred from enlisting. To aid in new aircraft designs he was allowed to observe planes during carrier operations under combat conditions. He always regretted not being able to fight in the war. Nearly thirty years later, when the opportunity arose to tour Vietnam as a sketch artist, his daughter Sharlyn tells us that "he jumped at the opportunity". He went on two month-long tours in 1968 and 1969. 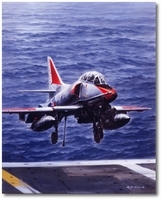 The Navy wanted him to portray its aircraft in action and afforded him the rank of captain to enable him to travel freely within the war zone. He joined river patrols along the Mekong Delta, search-and-rescue operations in Huey helicopters, 0V-10 Bronco attack missions and carrier operations in the Gulf of Tonkin. Although he went to Vietnam when he was in his mid-50s, he relished being in combat because, he wrote, "It was the only way to document the way it really was." R.G. 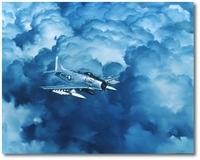 Smith's work is so highly regarded in military circles that in 1973 he was designated by the United States Navy "Honorary Naval Aviator" (number 10), a distinction previously bestowed on such notables as General James Doolittle, Admiral Hyman Rickover. R.G. 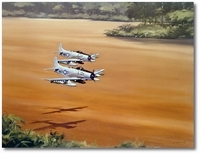 Smith created some two thousand paintings and drawings on a variety of subjects, but he is best known as an artist of naval aviation. 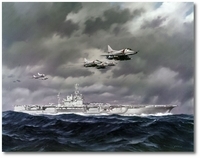 He received several awards during his illustrious career, including Salmagundi Club's Louis E. Seley Award for "outstanding achievement in the field of oil painting"; the Fighting Hawk Award for "countless, enduring contributions to the art, science and safety of U.S. Marine Corps Aviation"; the American Society of Aviation Artists Franklin Mint Award; and the U. S. Naval Institute Award of Merit. 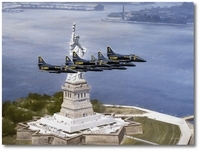 In 1979, the Navy's Flight Demonstration Squadron named him an Honorary Blue Angel. In 1994, he became the first recipient of the "R.G. 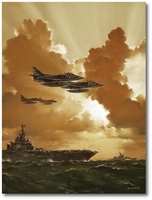 Smith Award" - named in his honor - by the National Museum of Naval Aviation in Pensacola, Florida. In the year 2000, the Smithsonian National Air and Space Museum in Washington hosted for six months a special exhibition of twenty-five of R.G. 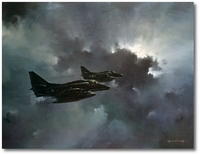 Smith's aviation paintings and drawings under the title: "The old Master of the Sky". 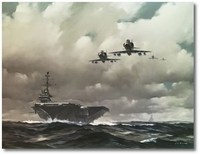 "A-4 Out of the Sun"
"A-4s Over USS America, CVA-66"
"A-4s Over the USS Ticonderoga, CV-14"
"F4F Wildcat Over Henderson Field"
"FW-190s Attacking B-17 Flying Fortresses"
"Hornets Over the USS Eisenhower"
"Spads Patrolling a River in Vietnam"